As usual, every last Sunday of the month, the CaminoWays.com team organises its sociable Prep Walk, which gathers experienced and beginner walkers. 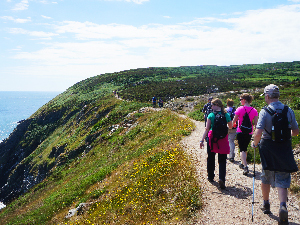 On the 29th of June our Sunday Prep Walk took place in Howth, Co. Dublin. Our friendly Product Manager Adam was the leader of the group. Claire, one of our sales colleagues and myself came along to enjoy a great Sunday morning. Well it turned out to be a great day but to be honest at first I wasn’t really confident about the weather we would get. Indeed, while we were driving along Dublin Bay we could see, not so far way, a drizzling rain. I started to get nervous and grumpy as I thought of walking in the rain with a pair of sneakers which are not waterproof. Let’s just say, Converse shoes are not really the proper walking gear that you are supposed to wear for our Sunday walks!. By the time we met up with Adam and Claire at the car park of the ‘Summit Inn’ pub close to the Beacon House on Bailey Green Road, the clouds started to clear up leaving a bright blue sky instead. Before heading out on the trail, Adam did a quick speech to introduce the walk we were going to do and remind everybody of the basic safety rules while walking. According to the signpost, our Prep Walk was going to be a 10km walk along Howth’s cliffs. We waited for everyone to get ready and we took off at 10am instead of 9.30am. A little delay that didn’t bother anyone as the nice weather gave people the chance to have a little chat before starting. We set off on the purple way-marked trail and after the first steps we could already notice that the track wasn’t going to be easy. Narrow, bushy and stony with steep up and downs, we would have to be ready for the challenge ahead. However, the scenery was worth the sweat. 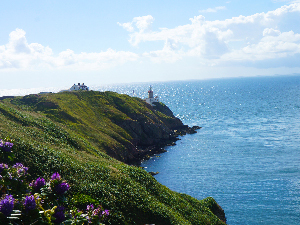 Stunning and impressive with a beautiful blue sea beneath us, the cliffs of Howth have to be seen. It’s a great spot if you want to spend a bit of time with your family and have a swim especially when the weather is that brilliant. To catch our breath and have a little bite, we stopped at the half-way point of the walk. It was the perfect time to sunbathe, chill out and enjoy being together on this sunny Sunday morning. Off on the second stage, at least that was we thought, we walked downhill to reach the town of Howth. Certainly a Scottish music gig was going to take place, as while we were walking we saw a group wearing traditional Scottish kilts and playing bagpipes. On our way uphill, still following the purple way-marked trail, Adam and I felt we should reach the car park soon because we had already walked 10km. Unluckily that wasn’t the case. Indeed, we walked roughly 3km more and those 3km for me were tough. While I was struggling I didn’t want to give up. When we finally reached the car park it was nice to hang out for a minute or two sharing impressions with the others about the walk over a cup a coffee that was well deserved. We could be proud of what we had just accomplished. Even if the walk was longer than we expected I can’t wait to do it again next month, 27th July in Lough Dan for the CaminoWays.com Walking Festival. I hope to see everyone there to help us celebrate St. James Day with us and once again share another great Sunday morning. If you are preparing for the Camino de Santiago why not join us the last Sunday of each month for our Prep walk? You can find our next location on the CaminoWays.com Facebook Events Page.